If you’re editing a design and you want to modify its template, you must open the template in a separate tab. You can do this within the Editor, or you can open the template from the Library. 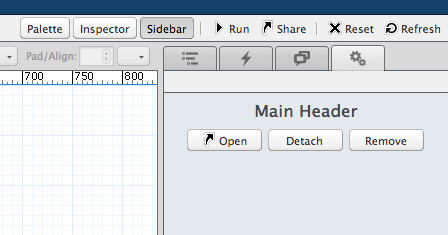 Click the Sidebar button in the Editor toolbar, or use the keyboard shortcut. The template information is located in the Settings tab, marked by a gears icon. Click the Open button. The template opens in a new Editor tab. Note that you can also double-click any template component in the canvas to open the template. As shown below, click the Open button in the Settings tab to open the template for editing.